Not only can you achieve incredible health benefits from Trans-D Tropin®, we will pay you $24.75 for EACH new customer you refer to us. * But here is the best part, we'll KEEP paying you this every month as long as the customers you introduce keep purchasing. 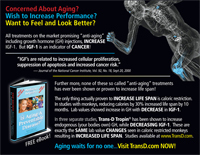 And when you realize that more than 80% of people that start using Trans-D Tropin® get on auto ship and stay on auto ship, this becomes VERY exciting. Yes, you read that correctly! You get paid every month for the same referral, as long as they continue to order. And you can literally start in less than 5 minutes. If you've ever seen a good movie or eaten at a great new restaurant, you may have wanted to tell your friends about the movie or the good food you ate. When you give the "recommendation" for others to watch the move or try the restaurant, it is considered "word of mouth" marketing which is thought to be the most effective form of marketing. However, the movie theatre or the restaurants usually don't show their appreciation for your "word of mouth" marketing efforts. The only difference between a movie or a restaurant and TransD.com, is that we are going to show you our appreciation. If you've used and experienced benefits with Trans-D Tropin® - I, and you want to tell others about the changes you've experienced on the product, we have an incentive program set up for you called the Affiliate Referral Program. It's a "win-win-win" for everyone involved and is ridiculously simple to implement. Here's how it works. An Affiliate program is nothing more than a "Referral Program", where a company rewards the people who help to spread the word about their product or services. With Trans-D Tropin® - I, we take this concept to the next level. We have implimented innovation with simplicity to create the easiest way for you to take advantage of the "referral program" and build a source of residual income for yourself. (Click to Enlarge) As an example, the images to the left are the front and back of a card that is personalized with your Unique Affiliate Identifier (UAI). This UAI is a unique code just for you and acts as a discount code for anyone who purchases Trans-D Tropin® using this UAI. But this same UAI also acts as a method by which our system tracks the new customer back to you as the source of the referral. You can order these cards personalized with your UAI for a nominal fee. 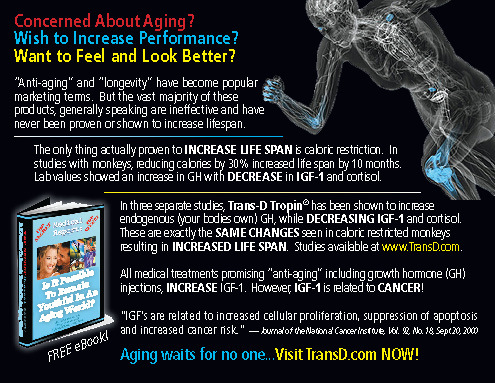 Instead of having to explain the benefits of Trans-D Tropin®-I, you just share these cards with everyone you know. To order your cards Click Here. Simply tell others what you think of the product and what Trans-D Tropin® has done for you. Then hand them this card with your own unique UAI on the back and enthusiastically encourage them to visit the website. The following is an example of a script you can use. "Hey, this is a great product and it did wonders for me. You ought to really do yourself a favor and check the website out. Here, take this card. It's got some info on the product and you can save $20 on your first order". That's all you have to say. Hand them the card and you're done. That's it! It's really that simple. You can literally do this in less than 5 seconds. The Trans-D Tropin® Affiliate program is designed first and foremost, to help everyone earn enough residual monthly income to pay for their personal supply of Trans-D Tropin® - I. 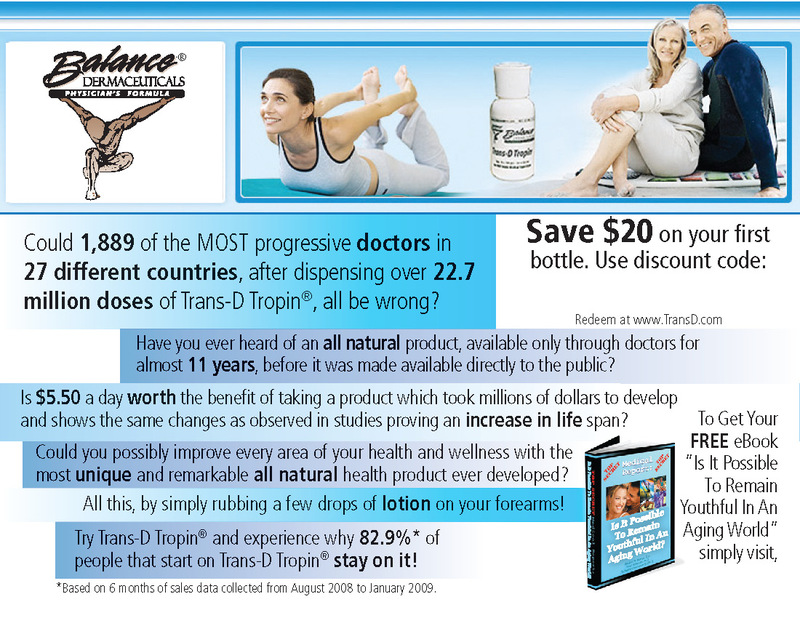 Simply refer 7 people to use Trans-D Tropin® - I and you are now earning more than enough to pay for your own product. The second goal is to help create a residual revenue stream for anyone who wishes to engage in "word of mouth" marketing of the best health and wellness product available on the planet today. There is basically only one thing that you need to do in order to get started earning a residual income from Trans-D Tropin® - I. This one thing you need to do is Get Your UAI and is broken into 3 steps which will take literally less than 3 minutes to complete. Once completed, you could earn enough money to pay for your Trans-D Tropin® - I for the rest of your life, by simply following a few easy steps, all of which you could do in less than a day. Our goal is simply to give you an opportunity to earn enough referral commission easily and effortlessly to pay for your monthly supply of Trans-D Tropin®-I. But for those who are interested in building this as a business and making this opportunity their primary source of income, the potential is absolutely unlimited. More details are provided.